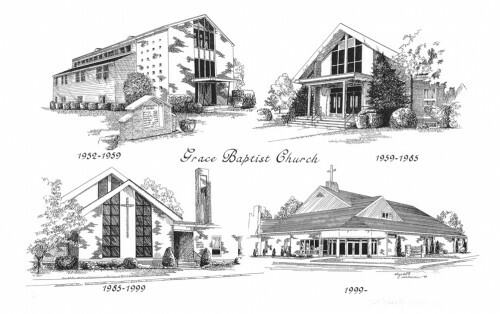 Grace Baptist Church began as Grace Chapel on Sunday, December 9, 1951. Two dozen people, united by a common love for the Lord Jesus Christ, had left a variety of denominations to form a congregation dedicated to the defense of biblical Christianity, the preaching of God’s Word and the spread of the gospel. God blessed the prayerfulness and faithfulness of that small band of believers, and within a year’s time Grace Chapel was holding services in a building constructed at our present location at North and Orange Streets. During those early years God caused the small church to prosper through solid leadership and exposure to Reformed and Puritan literature. A growing awareness of, and love for, the doctrines of God’s grace in salvation led the assembly to embrace the London Confession of Faith of 1689 as its doctrinal foundation. During the same year, 1959, the name of the church was changed to Grace Baptist Church. God has remained faithful to Grace Baptist Church through the years, enabling us to build upon a Christ-centered foundation and to find practical expression for our Christian testimony. In 1968 Grace Baptist Christian School opened and has been used of God to educate many young people. Meeting in the Grace Baptist Church facility, the school is governed by a Board comprised mostly of members of the church and provides a God-centered education in a traditional classroom context. For the past half century of our existence as a church, the Lord has blessed us with faithful ministers. Our former Pastor, Walt Chantry, began his labors among us during his years as a student at Dickinson college. Upon graduating from Westminster Seminary he was ordained and in 1963 began his long and fruitful pastoral ministry at Grace Baptist Church. In June of 2002 Pastor Walt retired. David Campbell came to Grace Baptist Church in August of 2002 and continued to serve as our Senior pastor until November of 2016 when he accepted a call to North Preston Evangelical Church in Preston England. July of 2017 John Miller was called to Grace Baptist Church as Senior Pastor. John previously served as a Pastoral Assistant at Grace from 2007 to 2010 before being called to plant a church in Clarksville, TN. We thank the Lord, that in his kind providence, he has seen fit to bring John and his wife Elizabeth and their four children back to Carlisle. Simon O’Mahony was added to the pastoral staff as Assistant Pastor in February 2018. Simon graduated from Westminster Seminary California and our association’s Institute of Reformed Baptist Studies. Once again the Lord has graciously provided for us by bringing Simon and his wife Megan and their three children to Grace Baptist Church. We look to the future with hope and expectation, knowing that “unless the Lord builds the house, they labor in vain who build it; unless the Lord guards the city, the watchman keeps awake in vain.” (Psalm 127:1). A history of Grace Baptist Church entitled Reflections on Grace is available from the church Book Room for $10.00. For additional information about the early days of Grace Baptist church read, Ernest C. Reisinger, A Biography also avaliable through our book room.